SAGINAW January 14, 2015– On their way back to the fire station from a suspected arson call on January 8, two Saginaw firefighters– members of IAFF Local 102– sprung into action to save a co-worker, and their co-worker is alive today because of their quick thinking. Their fire engine, stopped at a red light, began to roll forward before the light had changed. That’s when Lt. Christopher McGowan, 37, and firefighter Brandon Hausbeck, 24, realized their driver was unconscious. The two men sprang into action, stopping the truck and saving their fellow firefighter, who was suffering a cardiac emergency. Both McGowan and Hausbeck are trained EMTs, and were able to get their driver out on the ground after pulling the emergency brake. They were able to hook him up an Automated External Defibrillator (AED) and the device advised them to shock the driver. They also performed CPR and place him on oxygen until a police officer could arrive and transport him to a nearby hospital. Hausbeck said the AED was helpful because he did not know what was happening to the victim before the device analyzed his heart rhythm. Saginaw firetrucks added the devices to firetrucks within the past two years and the device proved to be crucial for the emergency situation. The department provides CPR and AED training on an annual basis, he said. 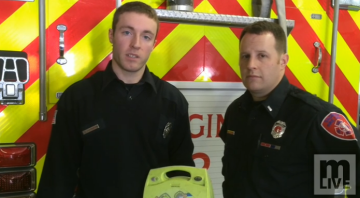 Hausbeck encourages people to learn how AEDs work and encourages business owners to consider purchasing the “invaluable” devices. The firefighter that received care, wishing to remain unnamed, stayed in the hospital over the weekend and was expected to go home yesterday. Hausbeck is currently the Vice President/Treasurer of IAFF Local 102, and McGowan is the Unit A Director. For the complete story on MLive, click here. This entry was posted on January 14, 2015 by WMALC in Michigan labor news and tagged IAFF, saginaw.